A couple days before the 50th Anniversary of the Karmann Ghia celebration we had a wonderful opportunity to explore 2 prototypes produced by Ghia. 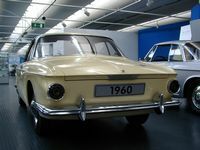 Our tour had been pre-arranged by Lee Hedges and Jörg Fischer and when we got to the museum we were surprised to find both prototypes together. 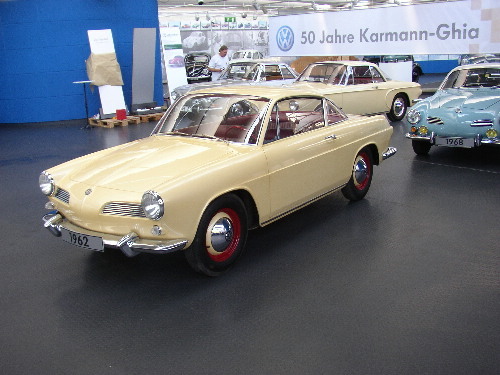 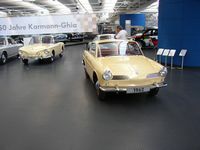 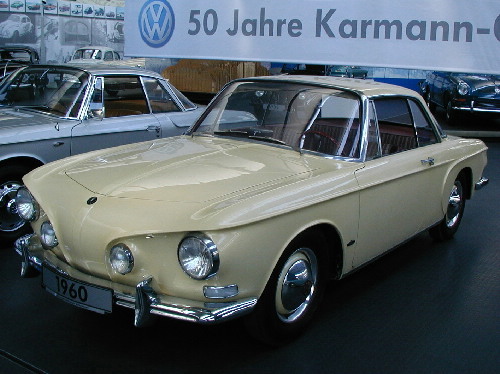 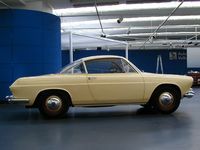 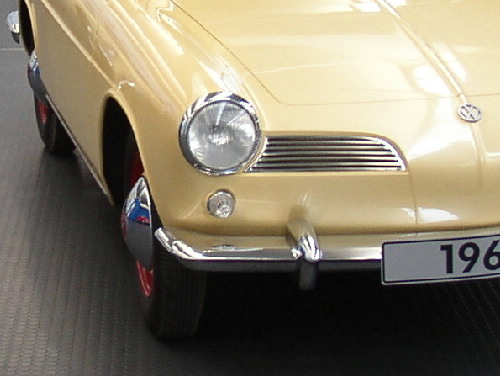 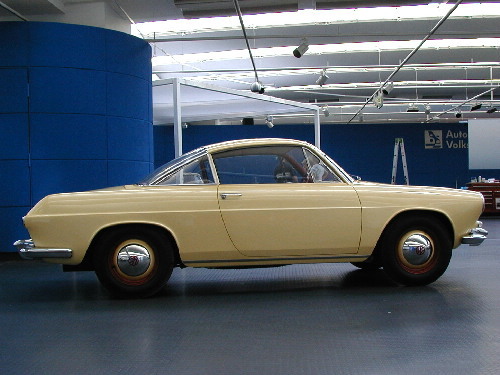 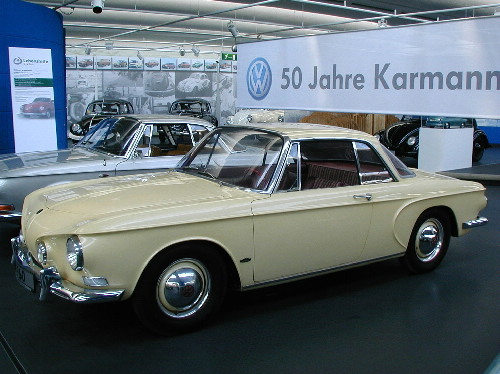 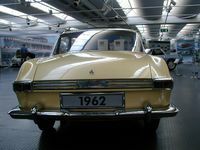 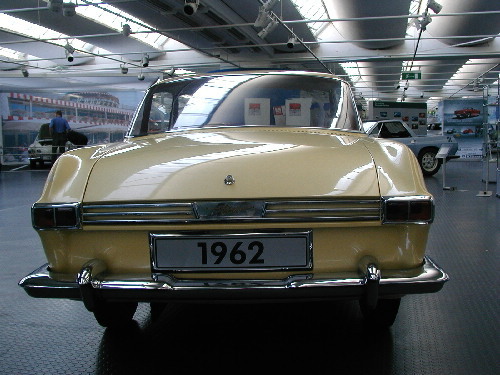 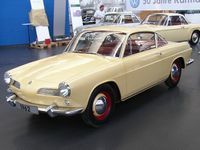 The design that was chosen to become the Type 3 Karmann Ghia has been displayed for a number of years at the Stiftung VW Museum in Wolfsburg with a 1960 production date. 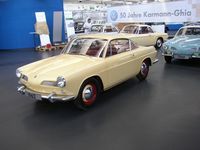 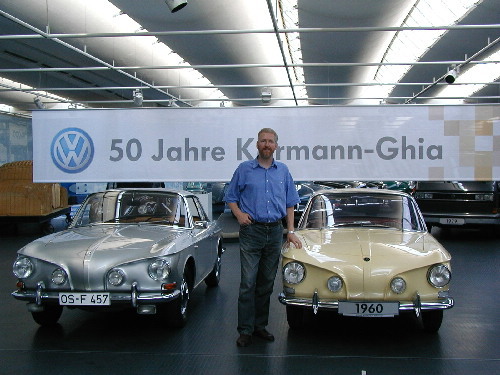 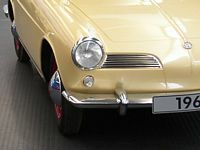 The other prototype in the pictures here has been part of the Karmann collection in Osnabrück with a claimed 1962 date. 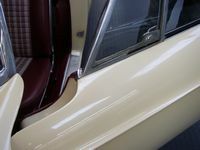 When I first saw these 2 cars I knew that they had to have been produced together and these pictures will document the reasons why. The pictures on the left are of the car normally kept at Karmann. 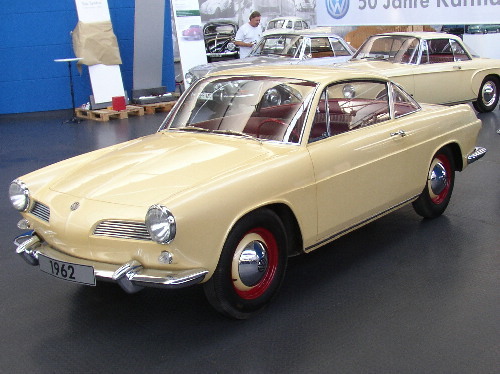 This car has been described by some as a Type 1 Ghia prototype but as some of the pictures will show it has enough similarities to the Type 3 body to justifiably be judged as another example of what might become the Type 3 Karmann Ghia. 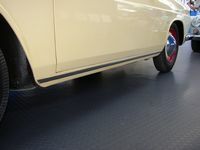 Dispite the obvious differences between the 2 cars the first thing one notices is that they are both the same color. The one on the left is somewhat lighter overall but I attribute this to differences in the way the cars were stored over the years. 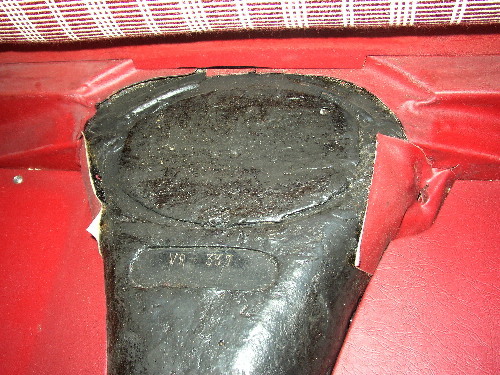 The yellow pigment in the paint is a color that is suseptible to fading. 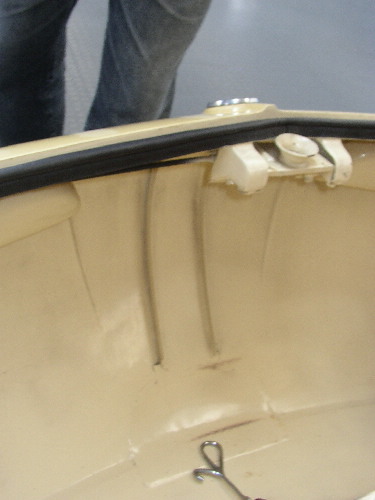 The most telling detail in establishing the common construction timeframe is the VIN on the tunnel. 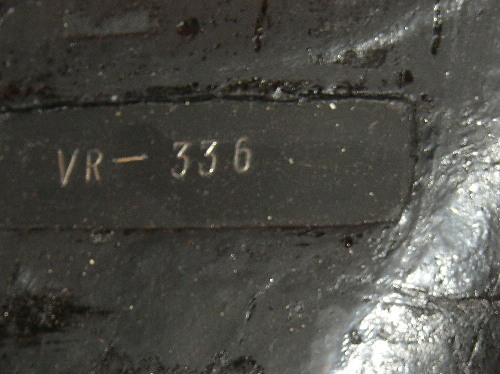 The VR designation was used by VW over the years on research vehicles. 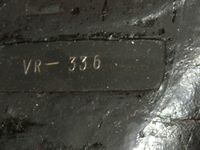 These 2 are VR 336 and VR 337. 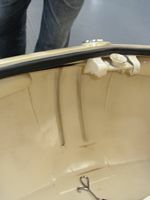 The body line shown on the left is one detail that was brought from that car into the final T34 design. 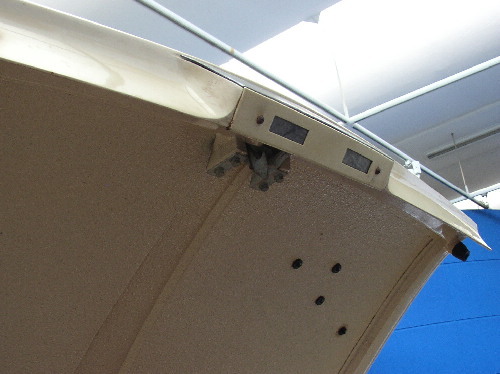 The shape of the nose is very different on the outside but the inside structure of the trunk is virtually identical. 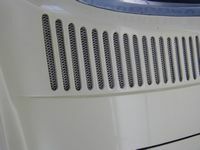 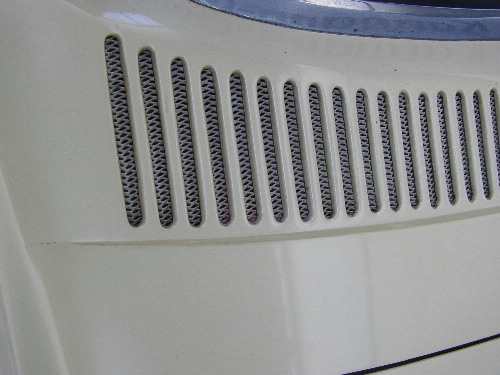 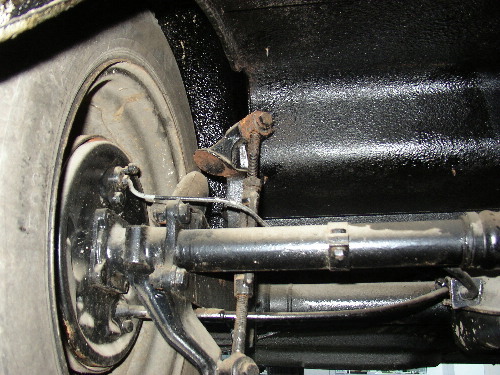 While many peole point to the front vents as being very similar to the T14 note the body line of the fender which is very close to the other Type 3s. 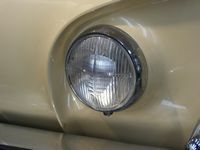 The foglights were a favorite but some pictures from the Karmann archives show that the exact position of them was moved around before this final arrangement was agreed on. 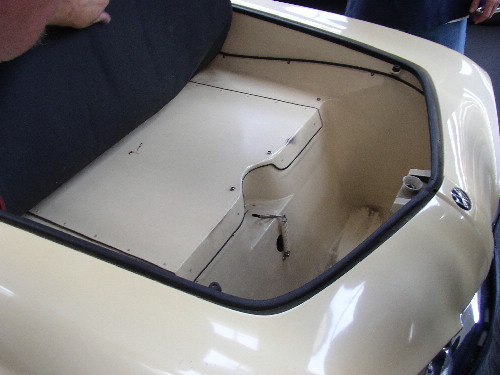 The real giveaway to the Type 3 lineage is the rear of the 2 cars. 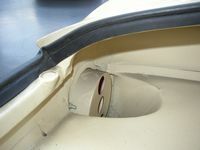 Both are designed to house the T3 pancake engine. 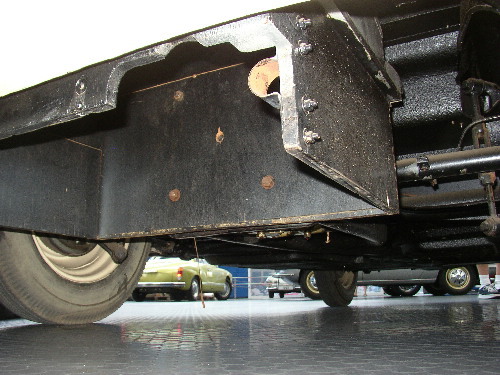 The rear undercarriage shows that these cars weren't built to ever be drivable. But one can see that VW had already designed the chassis that these and the other T3s would go on. 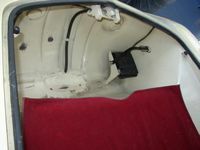 Note the wooden box in one that presumably gives the designers an idea of the size of the engine and cooling tin which was still under development. The dash treatments are very different one more American and the other a more European in look. The rest of the interior treatments though are nearly identical in design and materials. 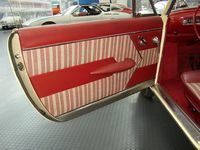 If these cars really were made 2 years apart it is doubtful that the exact same materials and colors would have been used. The rear seat areas were also identical. 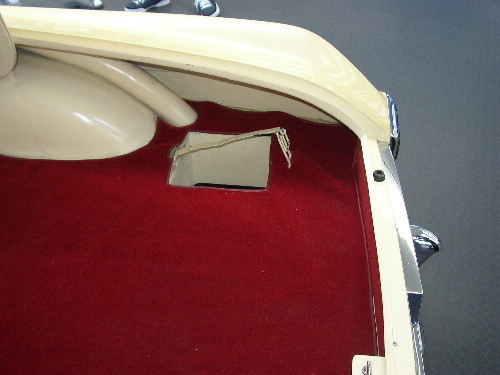 Note that the seat bottoms are 3 separate pieces with cushions on the sides and a vinyl covered box over the tunnel. Inside the rear trunk areas are very similar with the key difference being that the car on the left having the battery box back there and the other car having the battery tray in the nose of the car. 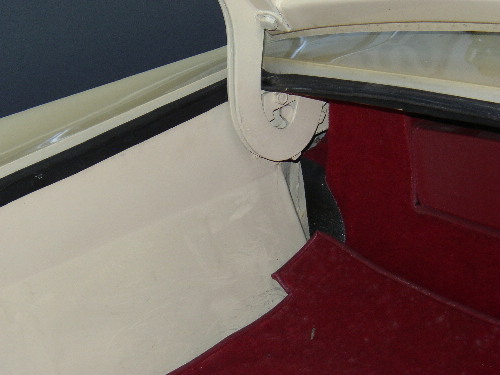 That's it for the comparisons but there are some further details that I want to point out. First, the rear vent on the design that was chosen didn't make it into production but these 2 pictures show how the vent was designed to direct cooling air to the engine compartment. 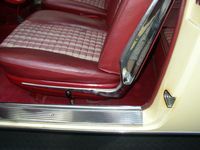 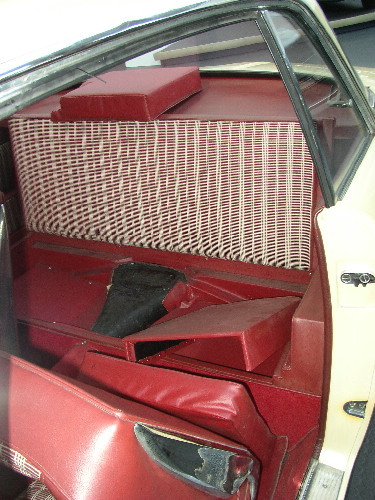 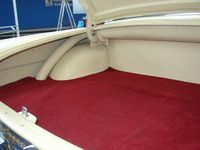 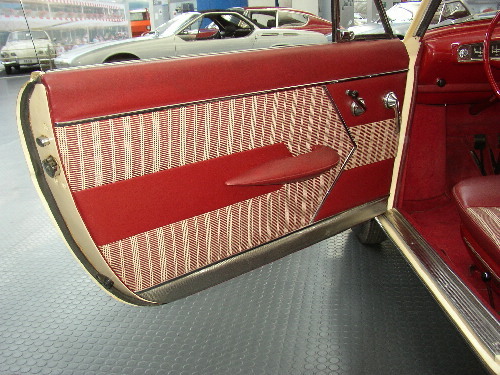 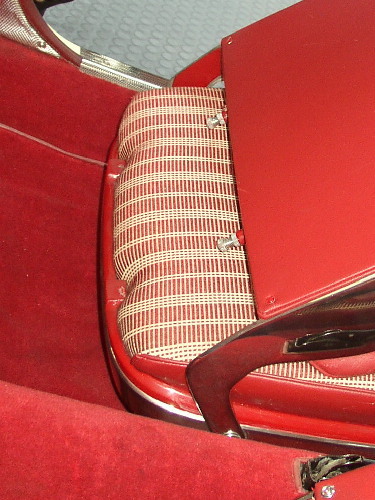 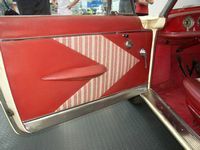 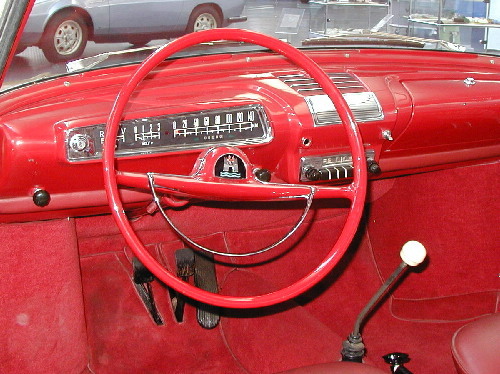 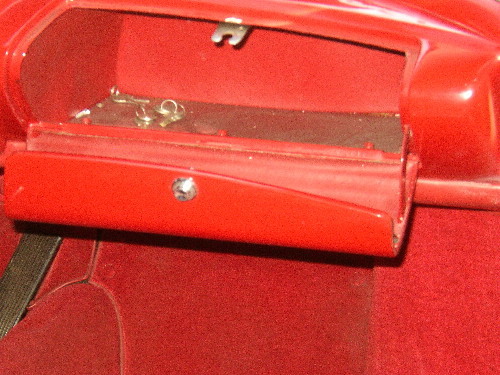 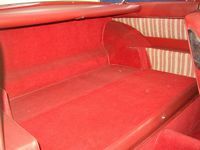 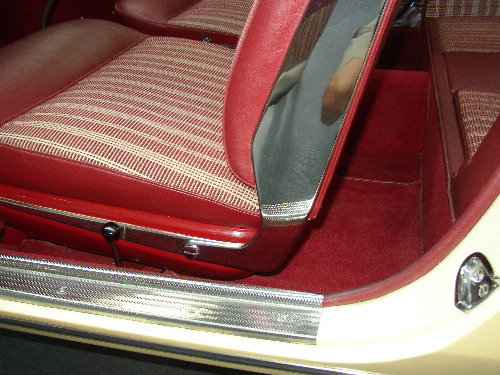 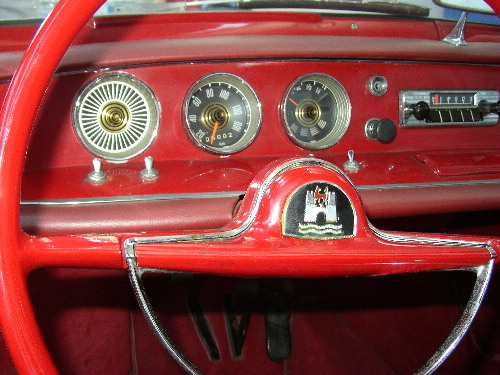 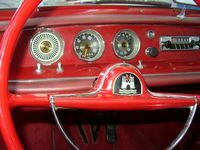 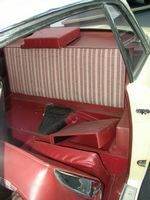 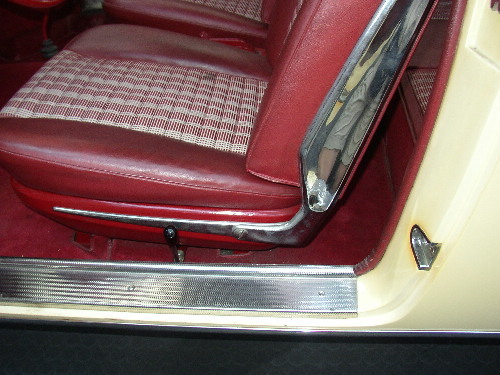 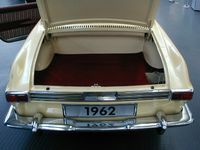 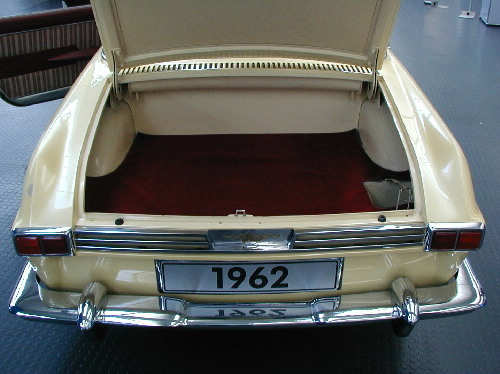 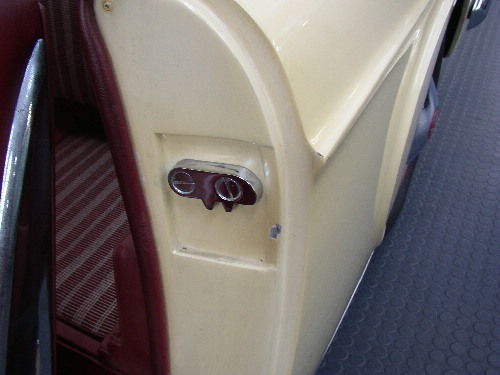 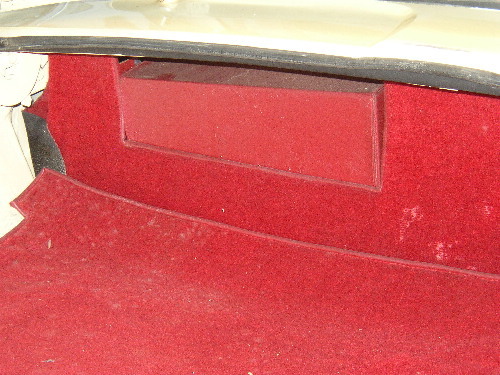 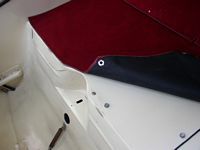 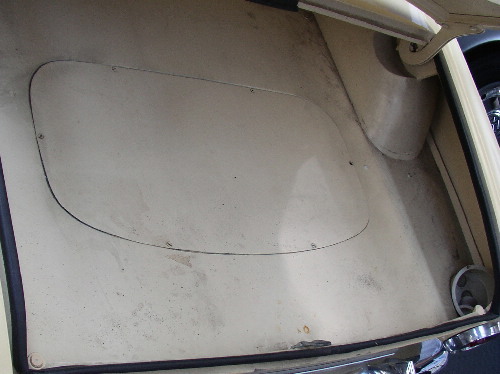 The bottom of the seat backs have an adjustment that was used on the early Type 1 Ghias. 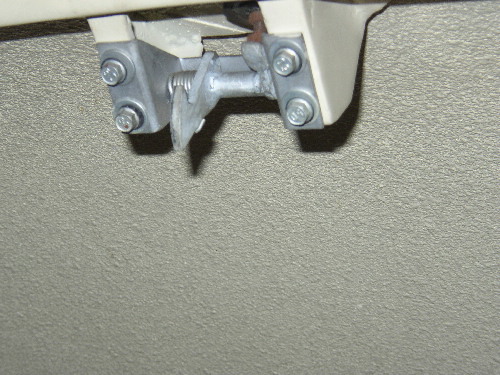 The screws thread out to adjust the seat inclination and a stop nut keeps the adjustment from changing. 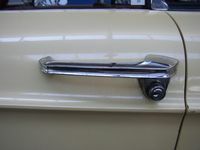 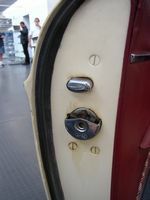 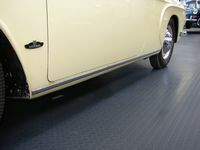 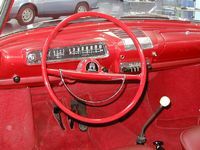 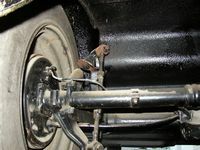 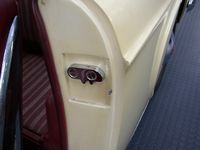 The trunk hinges, both front and back, in both cars are of a style that is found in the Porche 356. The glove box reminds me of American cars from the '50s. While the wing window is very similar to the final production version the door latches are more similar to those used in American cars. 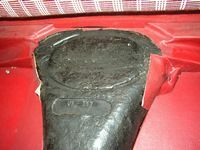 Our guide was wonderful and very interested in the discoveries we were making.